My husband and I both LOVE Mexican food. It is just delicious. We both also love Corn Tortillas. In my opinion you just can't eat a mexican dish without a stack of warmed corn tortillas. I prefer to have my tortillas warmed on a comal, but a burner, or pancake griddle will work as well. The problem with corn tortillas is that if you are cooking several of them at once they don't stay warm for long, and who really wants to be the one on tortilla duty. There are some wonderful little things called Tortilleros. The whole purpose of a tortillero is to keep the tortillas warm. I picked up this little dandy when I lived in San Antonio (where I fell in love with corn tortillas). I love this tortillero because it reminds me of a city and many people that I love, but unfortunately it was in sad condition. I decided that it was time to update our little tortilla cozy and possibly improve it as well. This is what I came up with. I used some great Anna Maria Horner Fabric "Good Folks Button" along with a thin cotton batting, extra wide double fold bias tape, and unbleached cotton for the inside. I really think that the Anna Maria Horner fabric was perfect for this project. *Please make sure to use 100% cotton fabrics and materials for this project. Synthetics and the microwave don't mix. Now I didn't have a pattern but I used my old tortillero as a guide. 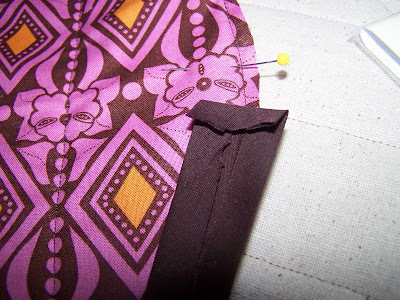 It is a simple project and the most difficult part of the project is attaching the bias tape. I simply traced a plate for my circle, my circle ended up being about 10 inches in diameter, but you could make it larger if you wanted it to accommodate larger flour tortillas. I cut out two circles of the bat, unbleached cotton, and my print. I then sandwiched the pieces together with the print on top, bat in the middle, and unbleached cotton on the bottom. I made two separate fabric stacks. I stitched around the perimeter of the circles securing the layers. Next I quilted each stack of fabric. I ended up following the print on my fabric because it had very definite lines, but they ended up being about two inches apart. After quilting each piece I marked my circles in quarters using pins. You will be basically making an envelope out of your circles, so one half of the circles will be connected and the other end will be left open. Next I pinned my two stacks of fabric together at three of the four quarter points. I began sewing my bias tape to the open end of the top circle. I like to fold the bias tape in at the end to avoid any raw edges. I stitched near the edge of the bias tape around the first half of the top circle. When I came to the midpoint I made a small clip on the underside of the bias tape to allow for the added bulk of the two layers. 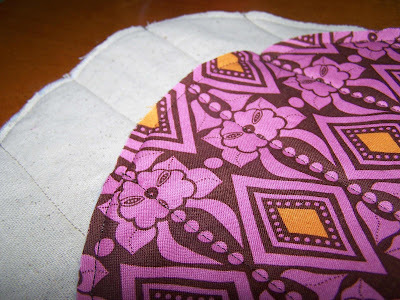 Sew bias tape around the second half of the circle including both stacks of fabric in the tape. When you reach the beginning of the bias tape you will need to begin sewing only around the bottom circle. I made a small clip on the top side of the bias tape and a small clip (just to the stitch line) in the top layer of fabric allowing the bias tape to bypass the top layer. I then attached the bias tape to the remaining portion bottom circle. When you reach the end leave enough tape to cover any exposed fabric on the bottom seam of your tortillero. Secure the ends of your bias tape by stitching toward the inner edge of the bias tape, or use a satin stitch to secure the ends. I am excited to make another of these. I think that I will be able to work out the little kinks that made them manifest in the sewing process. This was a relatively simple and quick project. Hopefully it will keep your tortillas and your belly nice and warm. I used our tortilla cozy just the other day when I was making enchiladas. I needed the tortillas to be warm and pliable, but I wasn't going to warm them on a comal, I simply placed a stack of tortillas in the cozy and threw them in the microwave for 1 minute. They were nice and warm and perfect for rolling. Let me know if you try this project out. oh squee! a cozy for the tortillas. That is a great idea. I end up with either paper towel which sticks or a manky old tea towel to keep them warm. Awesome idea! We love corn tortillas too, but they're only good if htey're kept warm. I'll add this to my list of projects to do! Great project! I think this would be a great gift to some Mexican Food lover friends! Thanks for the idea! This is great. I have the same tortilla dilema! I live in San Antonio...may have to go look for one, or better yet, just follow your tutorial and make my own! Will this work with flour tortillas too or only corn? Awesome Idea. Gonna make one for my mom for her birthday. A perfect gift idea. I might have to embroider mine like your original tortillero. This is a great tutorial, thank you. Our family is also a big fan of corn tortillas! My husband actually runs his family's business which provides the corn to companies that make tortillas! This might be the perfect thing to make him! What a GREAT idea! And I love that you can put the whole thing in the micro...this family of 7 needs all the "quick and easy" help we can get!!! I like the fabric you used for this project. I bet it would keep toast warm while on the tray on it way upstairs. FANTASTIC - warm tortillas for everyone! This is so easy and quick, I can make one up for everyone! Nothing worse than a cold tortilla at dinner! I was just talking about making enchiladas last night and keeping the tortillas pliable is always a time-consuming problem...now solved. I will make one today and have enchiladas tomorrow! Neat idea. In India, we make "Chapatis" with dough made out of wheat flour, a pinch of salt ,warm water and olive oil.They're a softer version of tortillas. 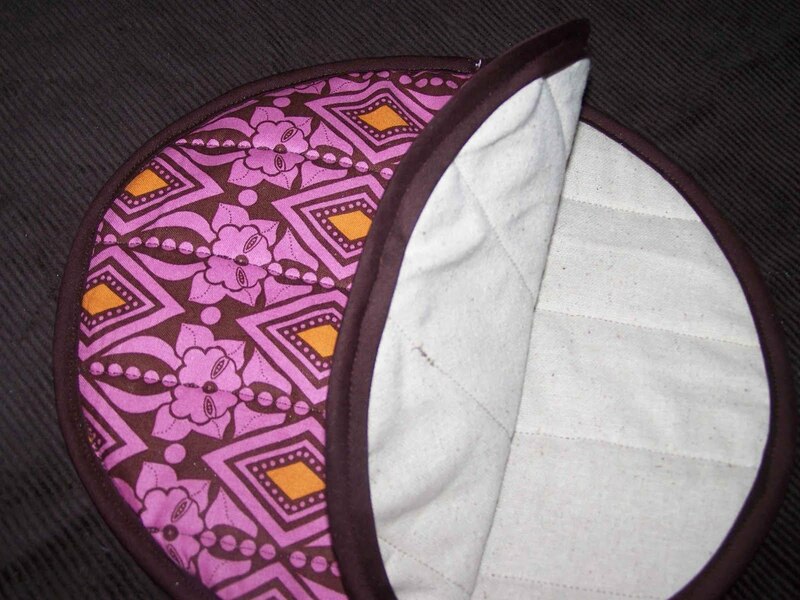 This cute cozy you've designed, would make an ideal cozy for Chapatis too. I shall sew this tmorrow. Lovely tutorial. usha sridaran. Making some for my G-Free friends. Thanks! 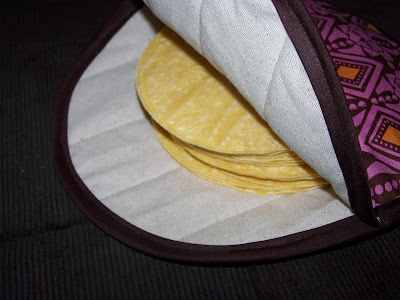 I didn't read all the comments but know you can buy insulated batting the kind for pot holders and gloves that would work well for keeping tortillas warm, and maybe second as a potholder!!! But then it might get dirty, and they are so cut as is!!! Thanks for the tutorial! Thank you so much for this!! Great little project, and it came out so cute!! I am also from TX (Houston), so this is a great item!! I love it so much, I am going to make them as Christmas gifts!! Ha, ha! Re the insulated batting mentioned by Anonymous, that batting is NOT microwaveable. 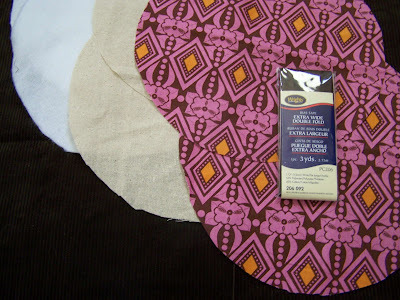 It has a mylar layer to provide the heat resistance needed for hot pads. I love this project! I've been looking for quick and easy gift ideas. Will have to give this a try! Am going to make these for EVERYONE! Plan on using a soon to be discarded, washed and dryed cotton mattress pad as the "filler". Tnk U for such great ideas. I just finished mine tonight and used it. It isn't quite as professional looking as yours, but it works! 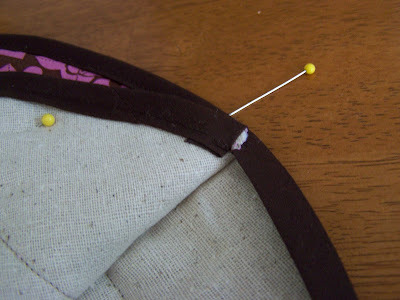 I don't know how to post a picture of it here, so I'm putting it on the allfreesewing.com, where I found this tutorial. Thanks!! OK...since I last commented on here, I have made at LEAST 15 of these for people, and everyone, without fail, LOVES them! I make one, somebody likes it, I give it to them and make another, somebody likes it, I give it to them and make another...and so it goes. I currently have a small one for corn tortillas and a large one for flour. THANK YOU! for this tutorial! I wish I could post a picture here for you!!! 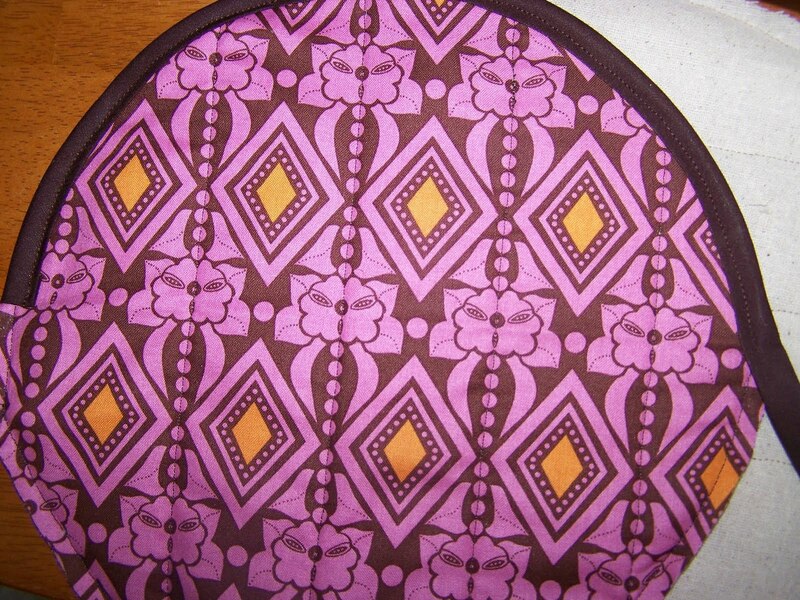 If using in the microwave be sure not to use anything polyester or cotton/poly blend as it could cause fire. 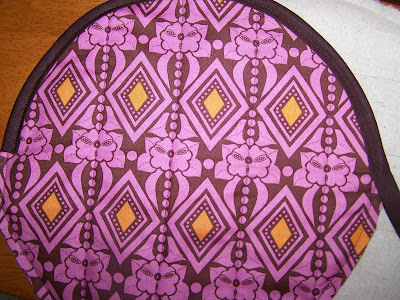 Use 100% cotton fabric, trims and batting if placing in microwave and I still watch it closely. I agree about the cotton batting and fabric requirements. I make baked potato bags and those stay in the microwave for 8 min. They catch on fire if you don't use the cotton batting and fabric. If using for only one minute, you might be okay but I wouldn't chance it. I need to make some of these! But please be sure to use ONLY COTTON batting, polyester bats or blends can melt and catch fire in the MW. My daughter bought a potato bag at a craft sale that caught fire the very FIRST time she used it. It turned into a melted, burned mess! Don't use the insulated (Insulbright) batting for potholders etc either, won't work in the MW, there's a foil mylar lining. I just finished embroidering a little burro...I can't wait to make this tortilla cozy for him to embellish! Absolutely love it! I want to make one too for my flour tortillas but me and bias tape do not get along at all. I avoid it whenever I can. No matter how hard I try or how many tutorials I watch and read I can't seem to get it right. Is there another way to do this without bias tape? I am new to sewing and can use all the help I can get. Self teaching. Also I don't see anyway of closing it. How do they stay warm if it doesn't close somehow? Hope you can help would love to make this. Love your choice of fabric too! Glenda- I can understand your frustrations with bias tape, it does take quite a bit of sweet talking to get it to cooperate. 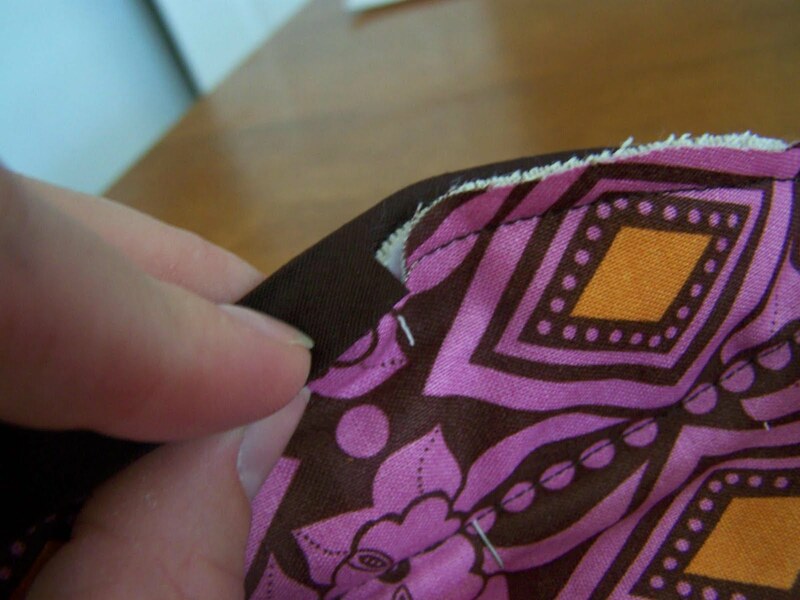 Another option might be to place right sides of the fabric together, and sew around the circles, leaving an opening for turning. You'd then have to clip all around the entire circumference of the circle, turn right sides out, and then stitch the circles closed. It would work. You're right that there isn't any sort of fastener to keep it closed, but it hasn't been a problem. Unless you are stuffing a huge amount of tortillas in it, it really shouldn't need a fastener. You could make an envelope style tab, so that there wouldn't be any exposed area. Other than that, I wouldn't recommend zippers, velcro, or buttons, especially if you have any intention of microwaving it. Glenda, if you have a serger, you could serge the outside edges and I would recommend using cotton thread. Hi there, I run a taco truck and am looking to commission somebody to make some of these (with a slight twist). If you are interested please contact me at info@thelittletaqueria.co.uk. Thanks Chris. My question....bias tape is not totally 100% cotton...will this be a problem? 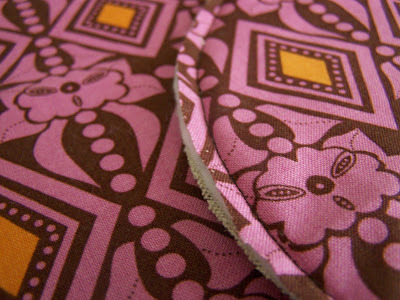 I realize you can make your own bias tape....but wondering if there is a brand available that is totally 100% cotton? Love the tutorial!